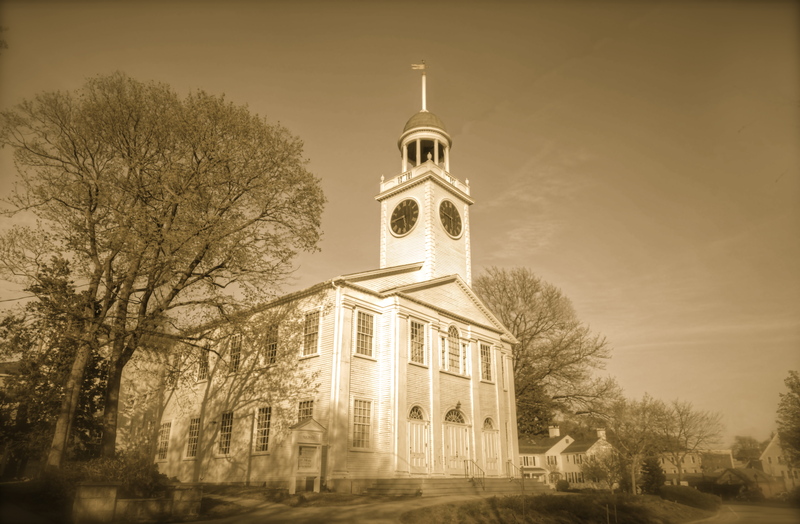 In 1805, there was only one meeting house in North Hingham, called First Parish in Hingham , now known as Old Ship Church or the Old Ship Meetinghouse. Following the resignation of the incumbent minister, a schism developed over the choice of a successor. Four deacons and a number of members of the church, followed by a substantial minority of the residents of the North Parish, withdrew from the old meeting house. The dissident group held its worship services in the old Derby Academy building on Main Street while work began on a “new North meeting house” at the foot of Lincoln Street. The frame of the new structure was completed on October 25, 1806 and the finished sanctuary was dedicated on June 17, 1807. 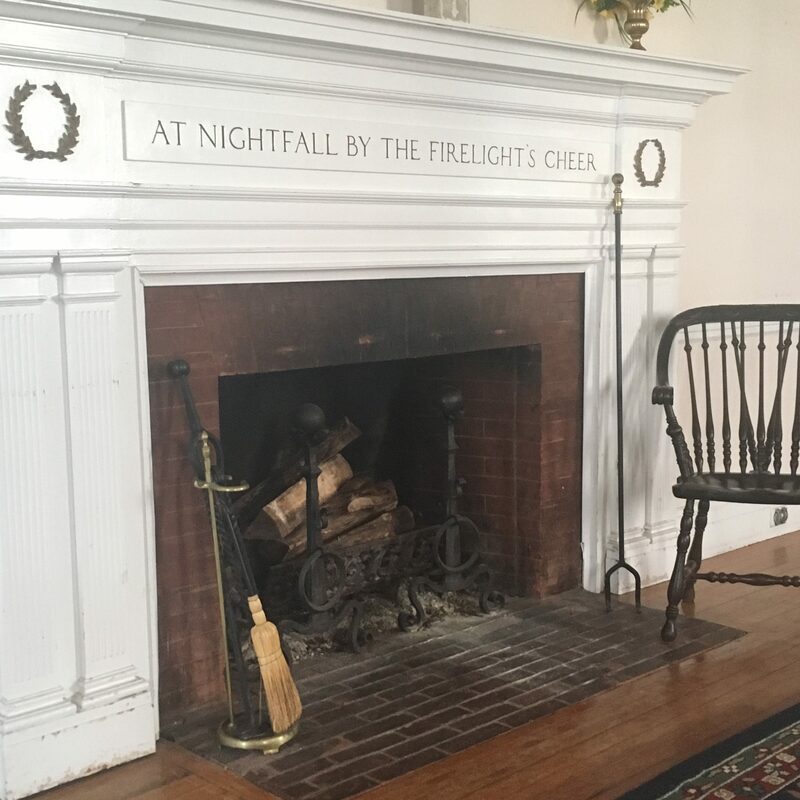 The building design has long been credited to Charles Bulfinch, architect of the State House in Boston and other memorable buildings of the era. Whether or not Bulfinch actually drew up the plans, the building’s classic style clearly shows his influence. 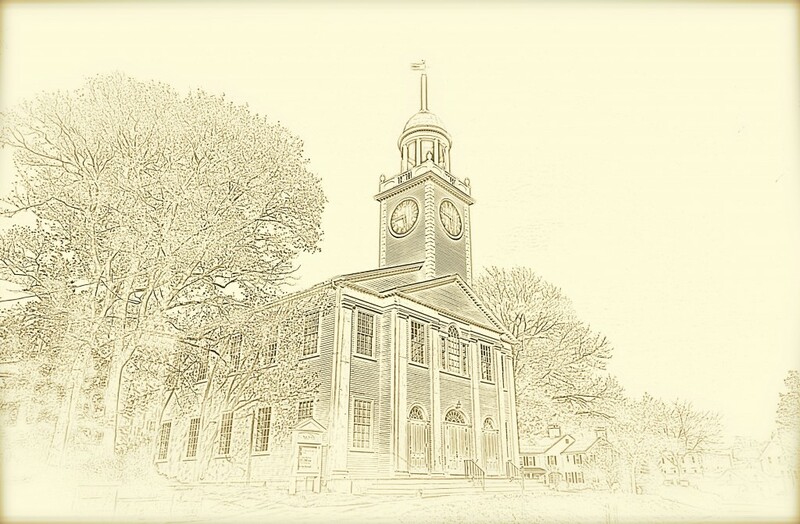 Click here to read the Act which incorporated the Third Congregational Society in Hingham, 13 February 1807’. 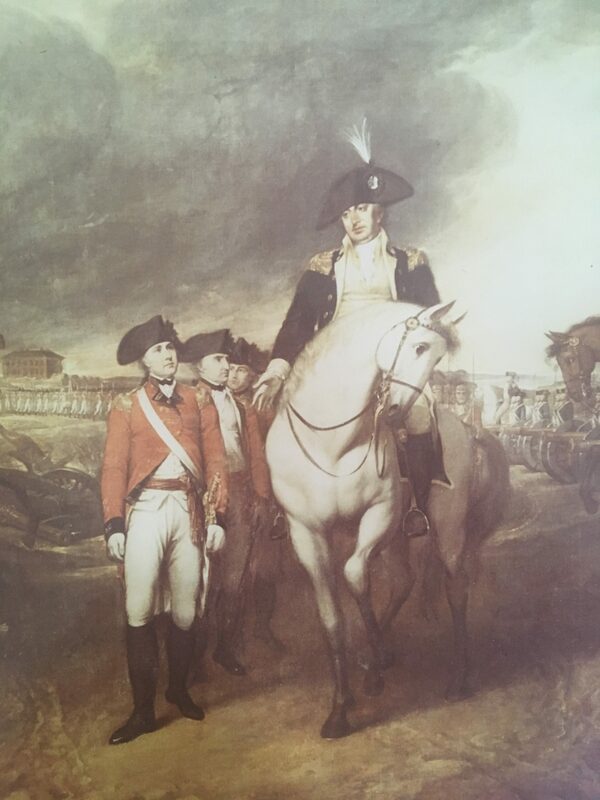 One of the leading founders of the new congregation was Gen. Benjamin Lincoln, lieutenant to George Washington and who accepted Cornwallis’s sword for him at Yorktown. 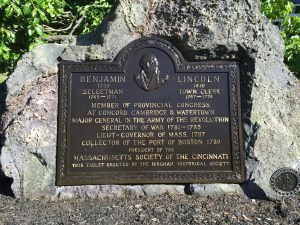 Gen. Lincoln was Hingham’s most illustrious resident of the time. No material change in the exterior of the building has been made since 1807. New pews were placed in the galleries about 1833 and an organ was purchased. The box pews downstairs in the sanctuary are all originals and are the oldest pews in Hingham. The clock, ‘procured by private subscription,’ was placed in the tower in 1845. In 1849 a contract was made with George Stevens for a new organ, for twelve hundred dollars. This latter instrument is the one still in use today, following a rebuild in 1973. 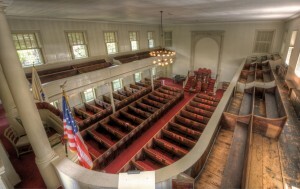 In 1852 the appearance of the interior of the church was much changed by the removal of the draperies back of the pulpit, and the painting of the walls and ceilings in fresco, including a tablet on the wall over the pulpit bearing the inscription, “Sanctify them through thy truth.” After these extensive repairs and alterations the meeting house was re-opened on Dec. 12, 1852. The Rev. Oliver Sterns gave the commemorative sermon. The uppermost galleries at the rear of the sanctuary were originally put in for the use of African-American servants and were long known as the “slave galleries.” On some Sundays, Ms. Lucretia Leonard, who worked as a domestic servant for three sisters: Eliza, Katy and Anna Thaxter, was the only African-American woman in the church and had to sit up there alone. 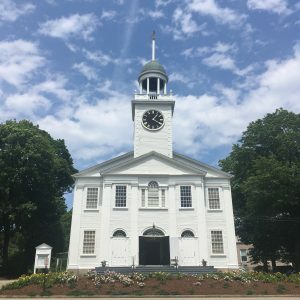 When the Plymouth County Anti-Slavery Society voted against church segregation in 1841, the sisters invited Leonard to join them in their front-row pew – with the support of the church’s new pastor, the Rev. Oliver Stearns. Some parishioners threatened to leave, but the sisters said they would worship from the church porch [front steps] if Leonard wasn’t allowed to sit with them. Lucretia joined the Thaxters in the family pew, and continued to occupy it even after all three sisters died. Lucretia’s descendants live in the area to this day. 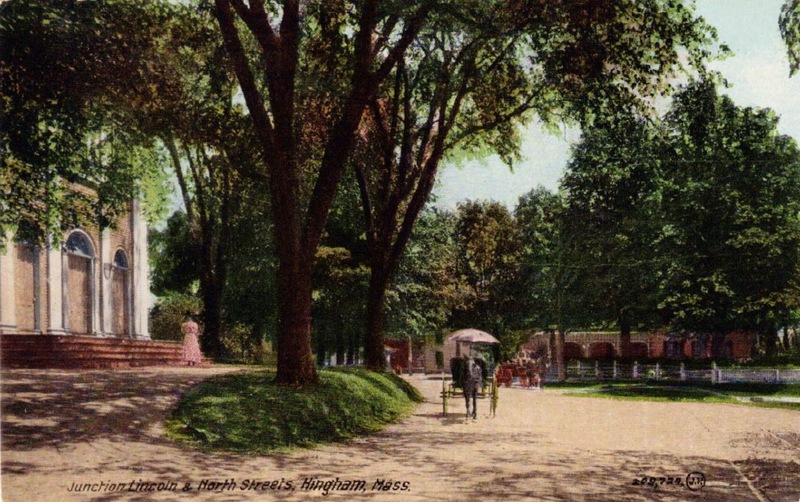 Hingham became a hotbed of abolitionism, and, in 1851, Rev. Stearns preached a sermon against the fugitive slave law. 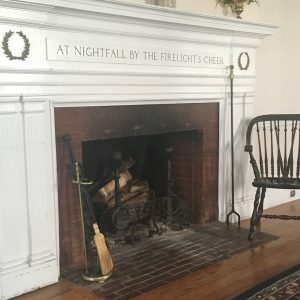 For a fuller treatment of Hingham’s role in the abolition movement, see Martha Reardon Bewick’s book, Tranquility Grove: The Great Abolitionist Picnic of 1844. In the spring of 1890, still further changes were made to the interior of the meeting house. The fresco painting gave way to tinted walls and ceiling of a less ornate character, some of the front pews were removed to give additional open space in front of the pulpit, new pulpit stairs were built, a drapery was put up on the wall behind the pulpit, and the organ was thoroughly repaired and improved by the addition of new pipes and stops. Governor John Albion Andrew was a New North Church parishioner during the Civil War. 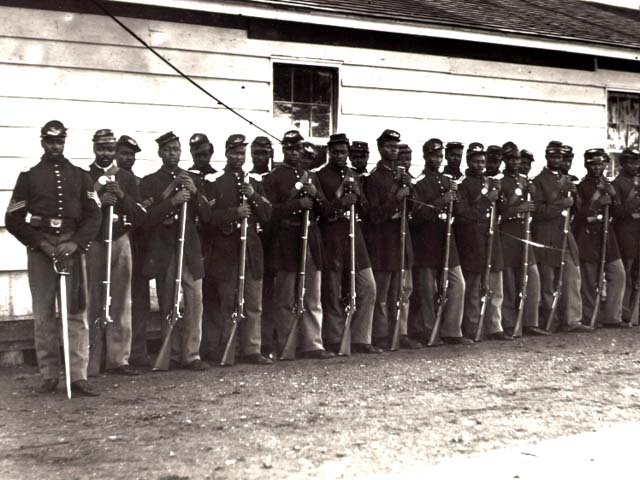 Early in February 1863, Andrew, an abolitionist, created the first regiment of free black soldiers to serve the Union in the Civil War — the 54th Massachusetts. More than 1,000 men volunteered, including Charles and Lewis Douglass, two sons of the abolitionist Frederick Douglass. The regiment was celebrated in the 1989 film “Glory” and commemorated in the high-relief bronze monument by Augustus Saint-Gaudens in the Boston Common facing the State House. John Davis Long (October 27, 1838 – August 28, 1915) served as the 32nd Governor of Massachusetts between 1880 and 1883. He later served as the Secretary of the Navy from 1897 to 1902, a period that notably included the Spanish-American War. 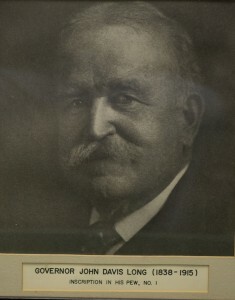 Born in Buckfield, Maine, Long was educated a lawyer at Harvard, and then settled in Hingham, Massachusetts in the 1860s. He became active in Republican Party politics in the 1870s, winning election to the state legislature in 1874. He was elected lieutenant governor in 1879 and governor in 1880. In one of his last acts as governor, he appointed Oliver Wendell Holmes, Jr. to the Massachusetts Supreme Judicial Court. Long was elected to the United States Congress in the 1882 election, and served until 1889, declining to run for re-election in the 1888 election. President William McKinley, elected in 1896, offered Long his choice of several cabinet posts; Long chose to become Secretary of the Navy, and he was confirmed by the United States Senate on March 2, 1897. 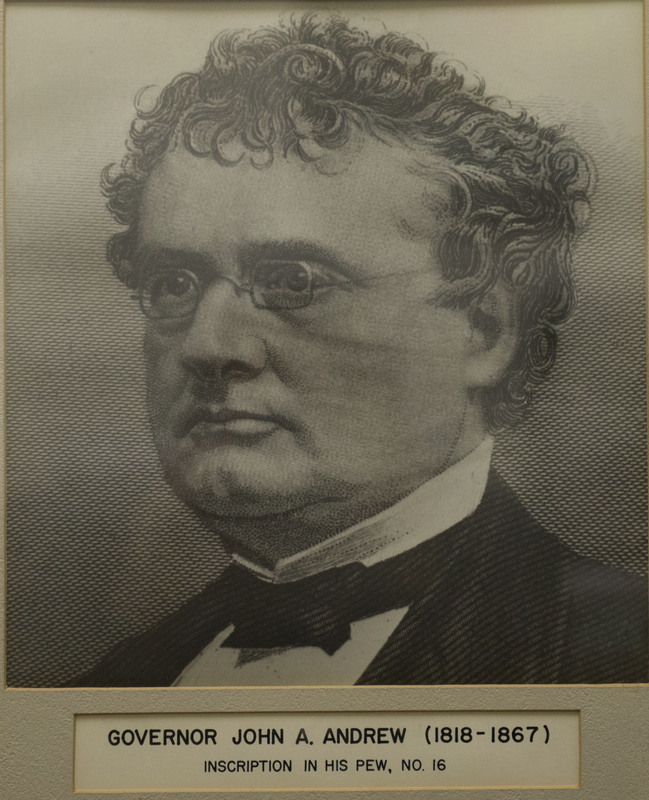 In his private life, Long was also a New North Church member. He sat in pew #1 near the door, perhaps because he loved “clustering in the vestibule” to chat with other church members. In the 1960’s, New North Church dissolved its connection with the Unitarian Universalist Association, and re-opened in 1970 as a community church that draws its membership from a wide range of denominational backgrounds. Today, New North Church is an independent Christian faith community that welcomes people of all religious traditions. We are both a congregation and a family, and we extend a radical welcome to all with a ‘faith seeking understanding.’ Our outreach and mission teams maintain several long-term ministries and we are always willing to try something new as we journey together in fellowship and peace. You can read more about Hingham church history here.